October 15th, 2018 - Does My Bomb Look Big In This? 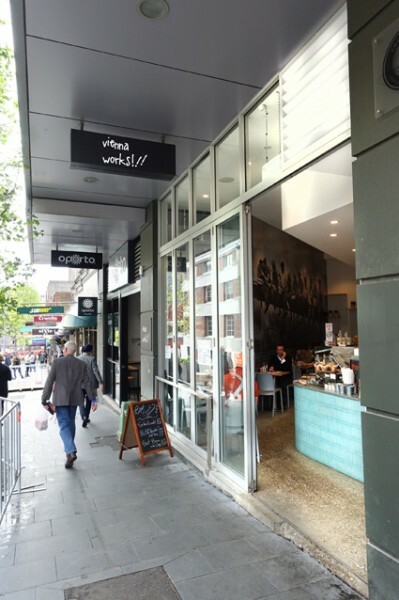 Swimming against the tide of businesses exiting the areas impacted by the NSW Government’s light rail disaster, Vienna Works recently opened up a sandwich shop in Devonshire Street. For nearly two years now, this formerly vibrant lunch zone has been an eyesore dominated by barriers and hoarding. Potential customers are plagued by dust, loud noise and uneven footpaths; so don’t even think of bringing someone who is vision or mobility impaired. 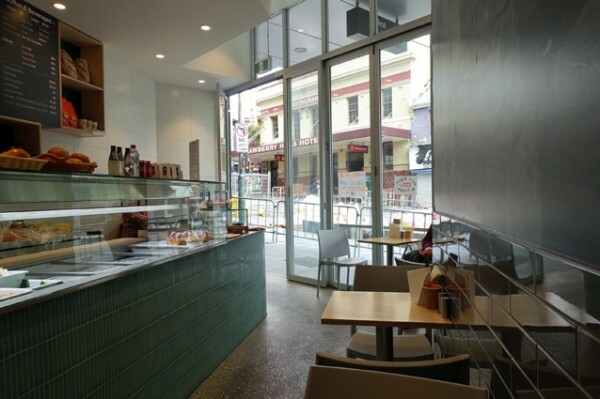 The narrow galley store is a clean oasis of pale blue vertical tiles and glass; with a long counter backed by menu boards taking up most of the floor space. The other side is decorated with black and white murals – Charlie Chaplin for laughs, and a row of men eating their sandwiches high in the sky along a steel girder. A row of tiny tables underneath affords a similar number of people the chance to eat underneath them in their own compact line. 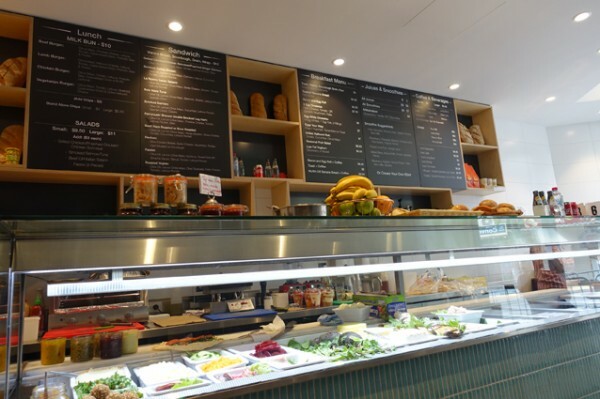 The menu feels one part sandwich shop, one part suburban milk bar. Out the back, one half of the Cypriot ownership team grills an honest line in old-school hamburgers. 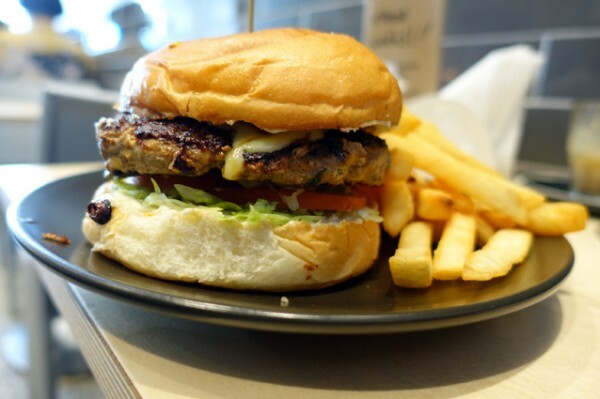 The Beef Burger with Chips ($12) presents a hand-shaped, well-charred beef patty flecked with herbs and slightly pink in the middle, on a milk bun with iceberg lettuce, sliced tomato, fried onions, long sliced pickles and cheddar cheese. The only modern touches are tangy citrus mayo. 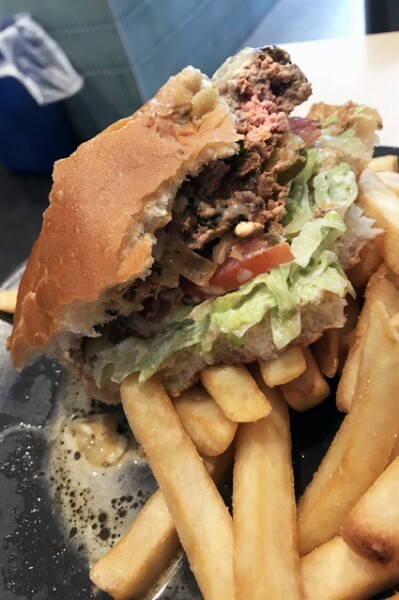 and probiotic ‘slaw; though I wish it had been drained properly because my burger poured so much liquid it dissolved the bun before I could finish it. To my palate, the big beefy taste would also be improved by some old-fashioned mustard and tomato sauce. 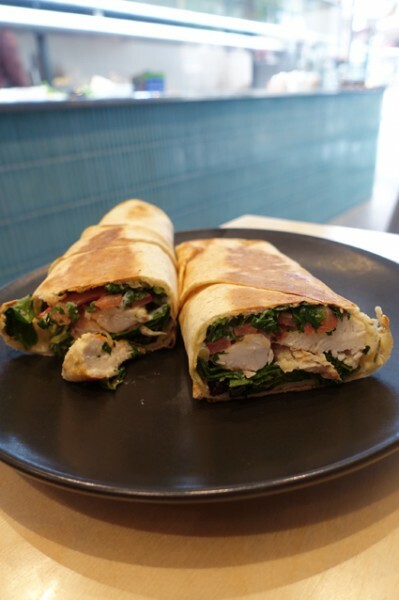 The Breakfast Wrap ($8) takes eggs, bacon and English spinach leaves, and dresses them with runny house-made tomato chutney. Be careful it doesn’t drip through the brown paper wrapping as you rush to work. At lunch-time the Grilled Lamb Wrap ($11) with hummus, salad, and tabouli is a near-constant special. Sadly on the day I dined, the sold-out lamb was replaced with bland chicken that didn’t really suit the combination quite so well. 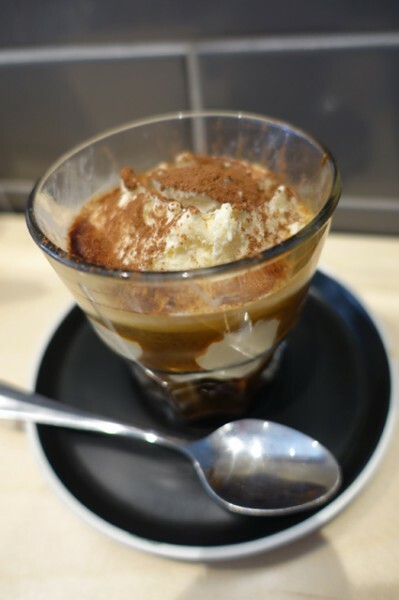 In the drinks department, robust coffee works out well in an Affogato ($4.50) against a scoop of commercial vanilla ice cream and a dusting of Kali premium drinking chocolate. 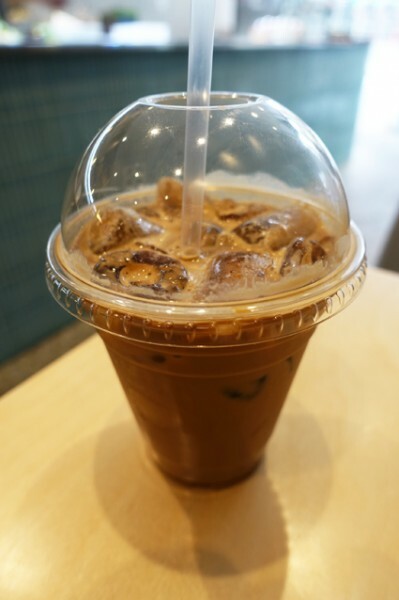 The Iced Mocha ($5) has a good balance between coffee and chocolate, though it arrived in disposable plastic, even when I opted to dine in. To my eye Vienna Works’ early success in this difficult zone is more about how desperately this area needed a decent sandwich shop then it is about exceptionalism.